HAPPENINGS WEST PALM BEACH MARCH 2018 Rita Rudner SkateTacular LEGENDS IN CONCERT THURSDAY, MARCH 1 AT 8 PM Legends In Concert is the longest-running show in Las Vegas and after 34 years, it is still voted the best tribute show! Four of their phenomenal artists along with a lively band perform with an uncanny similarity to the original artists they portray using pitch perfect vocals, signature choreography and fabulous costumes. We know you will agree with the Boston Herald’s review when they stated: “Was it real…or was it “Legends In Concert?” “To tell the truth, at times, it was hard to tell.” SLIGHTLY DIRTY AFTER 7:30 STARRING JOHN PIZZI & CHRIS MONTY SATURDAY, MARCH 3 AT 8 PM While 7:30 rhymes with dirty, show time is actually 8:00 pm. If you like your comedy with a little spice, this is the show for you! Headliner John Pizzi, noted for his one-two punch line style of humor and his friend Andy (one dirty little dummy) is one of the hottest rising comics and ventriloquists in the industry. A regular at New York’s best comedy clubs, Chris Monty is one of New York’s busier comedians as well as an accomplished actor. He appeared in the movie, Paul Blart: Mall Cop 2 and in the HBO series, Vinyl and the Netflix series Orange Is The New Black. DIRECT FROM ISRAEL The Habana Boys www.centuryvillagetheater.com KOL ESPERANZA TUESDAY, MARCH 6 AT 8 PM With music that bridges generations all over the world, these five fresh, bright entertainers expertly create a vibrant new sound, performing classic songs, opera favorites and Broadway hits. Audiences up and down the Florida coast have been raving about them with comments such as “Inspiring”, “Moved To Tears” and “Exquisite.” You too will have the highest praise once you experience their magnificent voices. NEIL BERG’S 102 YEARS OF BROADWAY THURSDAY, MARCH 8 AT 8 PM In a dazzling musical revue that covers 102 years of Broadway’s greatest moments from some of the best shows of the century, five of the most talented entertainers working on Broadway today along with a New York band perform the hit songs they actually sang. With composer/ lyricist/producer Neil Berg at the piano, this charming evening is a wonderful romp of American musical theater. ROBERT KLEIN SATURDAY, MARCH 10 AT 8 PM Witty, honest, self-questioning and always contagiously funny, Robert Klein’s humor is as relevant today as it was when he started out. This past March, STARZ paid homage to Klein’s comedic genius with a documentary special entitled Robert Klein Still Can’t Stop His Leg. He is funnier than ever, doing what he does best…making us laugh! Opening for Robert Klein is singer Tony Quaranti. POP, ROCK & DOO WOPP LIVE! WEDNESDAY, MARCH 14 AT 8 PM Take a step down memory lane with Pop, Rock & Doo Wopp Live! This fantastic show features musical legends Emil Stucchio & The Classics (Till Then), Rock ‘n’ Roll Hall of Famer Shirley Alston Reeves, former lead singer of The Shirelles (Will You Love Me Tomorrow, Soldier Boy, Mama Said) and Dennis Tufano, the original lead singer of The Buckinghams (Kind of A Drag). Don’t miss this one-night-only reunion of the biggest hit makers of the ‘60s! 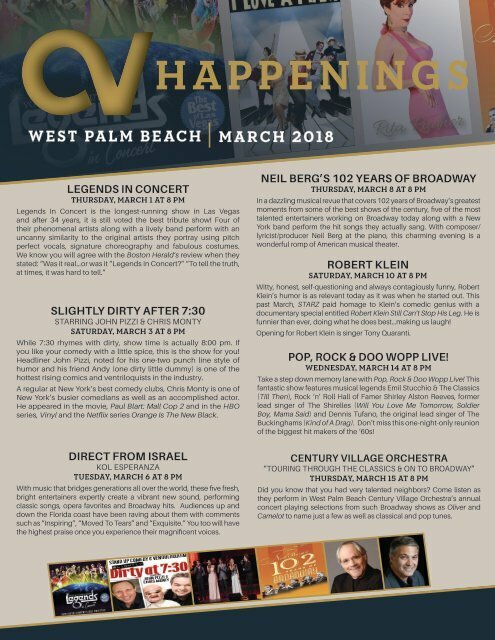 CENTURY VILLAGE ORCHESTRA A N E W M U S I C A L A D V E N T U THEA WEST PAL 2017 - 20 “TOURING THROUGH THE CLASSICS & ON TO BROADWAY” THURSDAY, MARCH 15 AT 8 PM Did you know that you had very talented neighbors? Come listen as they perform in West Palm Beach Century Village Orchestra’s annual concert playing selections from such Broadway shows as Oliver and Camelot to name just a few as well as classical and pop tunes.